a. Measure the voltage between terminals of the engine ECM connectors. NOTICE: Connect test leads to the connector’s backside. 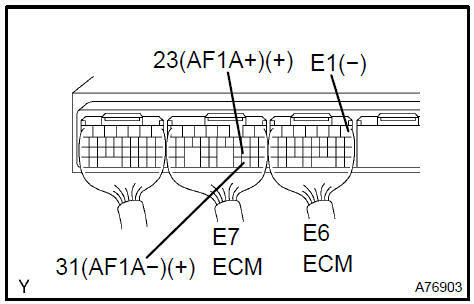 The connectors should not be disconnected from the ECM. HINT: Voltage between the terminals of the ECM is kept constant regardless of the voltage of the A/F . Connect the hand−held tester to the DLC3. Select ”DATA MONITOR”. Then select ”A/FS B1 S1”, ”A/FS B2 S1” and ”O2S B1 S2” to display the monitors. Warm up the A/F with the engine speed at 2,500 rpm for approximately 2 minutes. 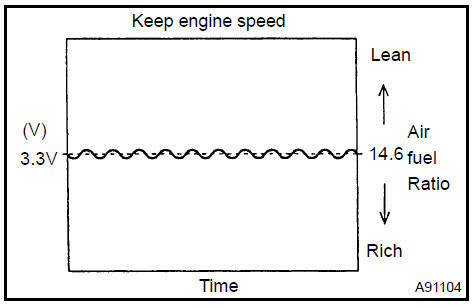 e. Keep the engine speed at 2,500 rpm and confirm that the displays of ”A/FS B1 S1” and ”A/FS B2 S1” are as shown in the illustration. The illustration may differ slightly from the display on the hand held tester. Only the hand−held tester displays the waveform of the A/F . f. Confirm that the display of ”O2S B1 S2” changes between 0 V to 1 V with the engine speed at 2,500 rpm. Increase the engine speed to at least 3,500 rpm. Use a sound scope to check for injector operating sounds. Check that when the throttle lever is released, injector operation sounds stop momentarily (at 2,500 rpm) and then resume (at 1,400 rpm). a. Check for cracks, leaks or damage. HINT: Removal or problems with the engine oil dipstick, oil filler cap, PCV hose and other components may cause the engine to run improperly. Disconnection, looseness or cracks in the parts of the air induction system between the throttle body and cylinder head will allow air suction and cause the engine to run improperly. If necessary, replace any damaged parts. a. Warm up and stop the engine. 1. Warm up the engine to normal operating temperature. b. Install a vacuum gauge (EVAP control system test equipment vacuum gauge) to the EVAP service port on the purge line. Turn the hand−held tester main switch ON. 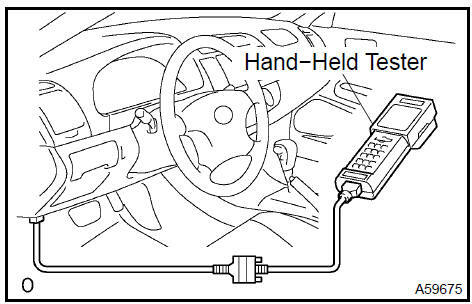 Use the ACTIVE TEST mode on the hand−held tester to operate the VSV for EVAP. g. Check the vacuum while the engine is idling. Maintain at 0.368 to 19.713 in.Hg (5 to 268 in. Aq) for over 5 seconds. 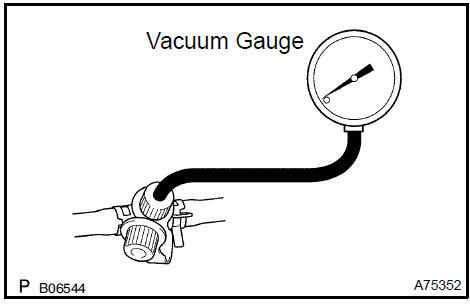 HINT: If the vacuum does not change, the hose connecting the VSV to the service port has come loose or is blocked, or the VSV is malfunctioning. Disconnect the hand−held tester from the DLC3. Disconnect the vacuum gauge from the EVAP service port on the purge line. k. Connect a pressure gauge to the EVAP service port on the purge line. Use the ACTIVE TEST mode on the hand−held tester to operate the VSV for CCV. NOTICE: In step m., the ignition switch should be ON, but the engine should not be running. HINT: If the check is not completed within 10 minuites, the VSV for CCV will be reset and close automatically. 1. Add 13.5 to 15.5 in.Aq of pressure from the EVAP service port. Standard: 2 minutes after the pressure is added, the gauge should still read over 7.7 to 8.8 in.Aq. HINT: If you cannot add pressure, the hose connecting the VSV for EVAP canister fuel tank has become disconnected or the VSV is open. 2. 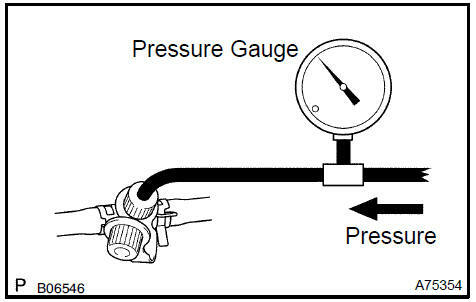 Check if the pressure decreases when the fuel tank cap is removed while adding pressure. 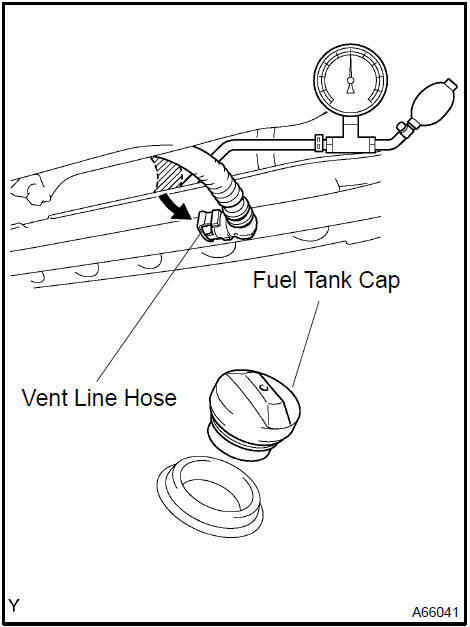 HINT: If the pressure does not decrease when the fuel tank cap is removed, the hose connecting the service port to the fuel tank is blocked. Disconnect the VSV for EVAP connector. Connect the battery’s positive (+) and negative (−) leads to the VSV for EVAP terminals. f. Check the vacuum while the engine is idling. Standard: Maintain at 0.368 to 19.713 in.Hg (5 to 268 in.Aq) for over 5 seconds. Disconnect the battery’s positive (+) and negative (−) leads from the VSV for EVAP terminals. Reconnect the VSV for EVAP connector. Disconnect the VSV for CCV connector. Connect the battery’s positive (+) and negative (−) leads to the VSV for CCV terminals. 2 minutes after the pressure is added, the gauge should still read over 7.7 to 8.8 in.Aq. Disconnect the battery’s positive (+) and negative (−) leads from the VSV for CCV terminals. Reconnect the VSV for CCV connector. Disconnect the pressure gauge from the EVAP service port on the purge line. Connect the pressure gauge to the fuel tank. 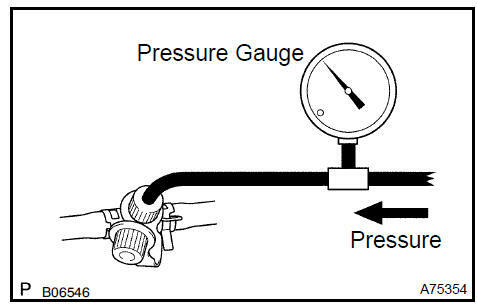 Apply pressure to the fuel tank to create an internal pressure of 4 kPa (41 gf/cm2, 0.58 psi). Check that the internal pressure of the fuel tank is maintained for 1 minute. Check the connected portions of each hose and pipe. Check the installed parts on the fuel tank. If malfunctions, damage or other problems are found, replace the fuel tank and filler pipe. g. Reconnect the vent line hose to the fuel tank. Fill the fuel tank with fuel until full. Apply pressure of 4 kPa (41 gf/cm2, 0.58 psi) to the vent port of the fuel tank. HINT: It is necessary to check the amount of fuel in the fuel tank. When the fuel tank is full, the float valve of the fill check valve is closed and no air can pass through. e. Remove the fuel tank cap, and check that pressure drops. If pressure does not drop, replace the fuel tank assembly. f. Reconnect the vent line hose to the fuel tank. Disconnect the air inlet line hose from the charcoal canister. Check that air can flow freely into the air inlet line. If air cannot flow freely into the air inlet line, repair or replace it. c. Reconnect the air inlet line hose to the charcoal canister. a. Check the power source voltage of the vapor pressure . Using a voltmeter, measure the voltage between terminals E8−18 (VC) and E8−28 (E2) of the ECM connectors. b. Check the power output of the vapor pressure . Remove the fuel tank cap. 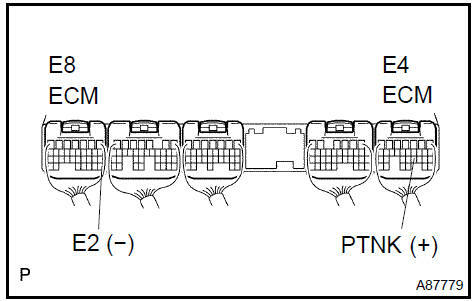 Using a voltmeter, measure the voltage between terminals E4−21 (PTNK) and E8−28 (E2) of the ECM connectors. Reinstall the fuel tank cap.